This entry was posted by mcfangirl on October 12, 2010 at 8:42 am, and is filed under Doctor Who, fangirls, Guest Post. Follow any responses to this post through RSS 2.0.Both comments and pings are currently closed. That is pretty much the coolest thing ever. I was unable to stay up all night but I love that you guys got a shout out. I'm a huge fan of the man, and I so wish I could've listened in too. AMAZING! Thank you Mcfangirl (and the rest of the #AbsoluteDTFangirls for making me feel like part of something instead of just a random obsession filled lunatic which is how I normally see myself (in the best possible way with all humor intended)! It was a wonderful time and I hope I get the pleasure of ::SQUEEING:: along with you all for a loooong time. I was going to post a comment, but GojyoChan said pretty much what I was going to. It was a fun Twitter party and reminded me that growing up doesn't have to mean growing old…thought I did pay for the late night all the next day! What a fun night that was! I was there for the birth of the #absoluteDTfangirls as well. My email was read just before (or just after, I can't remember! 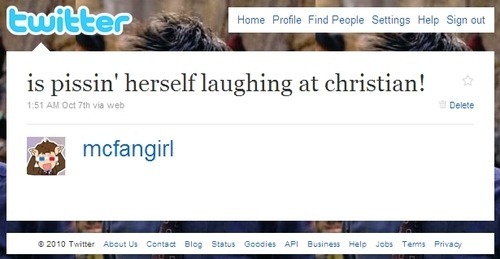 LOL) @mcfangirl's. Christian really seemed to get a kick out of all our emails and tweets. I can just imagine the craziness that will ensue when David comes back to host! 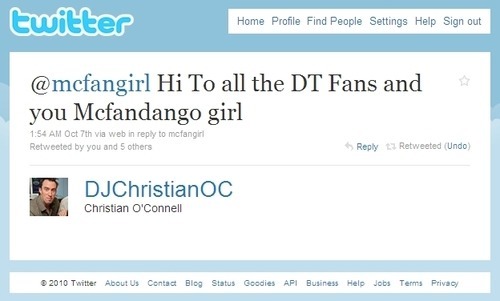 😀 I've always said that DT fangirls are the best around and the #AbsoluteDTfangirls have proved me right once again. Thanks for everything, ladies! I thought it was great that we actually got to hear Tara Wheeler be interviewed–finally a voice to go with the face! It was a fun night, but I could only hang until 2am EST. 4 kids + little sleep = Tired Sparkles.